Accounting for all of the inventory your business has on hand can be a daunting task. Fortunately, there are many inventory management software programs out there that do more than just accounting functions. This review covers 6 inventory management software options for retail, wholesale, manufacturing and distributors to better help integrate your entire business—across all departments, for better business management and ultimately better business results. Enterprise resource planning (ERP) is a way to integrate internal and external information across an entire organization, including integrating information from finance, accounting, manufacturing, sales, and other departments or divisions. Ability 585 ERP is accounting software designed to help you implement an enterprise resource planning system for your business. The software is designed to meet a manufacturer's need of traceability, especially tracing the actual costs of production and is also designed to operate effectively in a lean manufacturing or lean production environment (where expenses of resources for any goal other than creating value to the customer are eliminated). To this end, Ability 585 ERP aims to improve a manufacturer's profit margins, reduce costs, and increase process efficiencies. 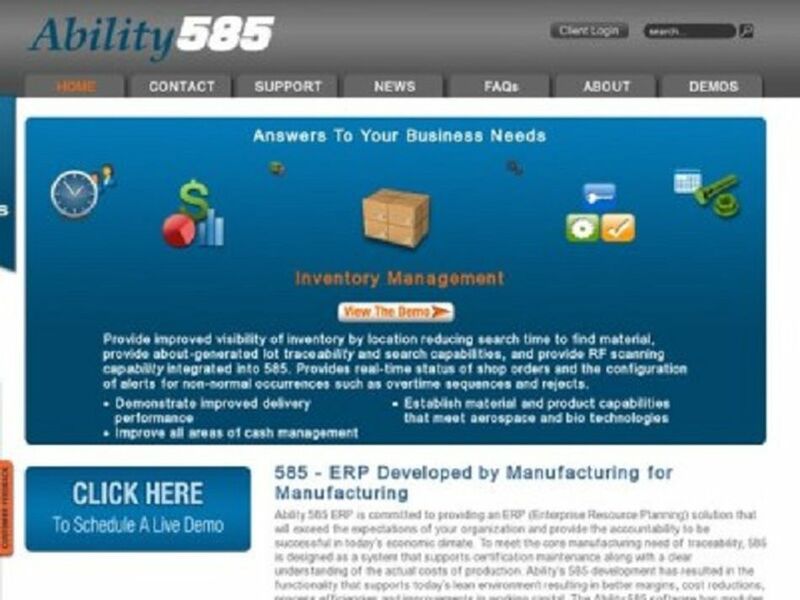 The Ability 585 software has accounting software modules, which include Master Resource Planning, Project Planning, Scheduling, Orders, Accounting, Shop Floor, among others. Connected Enterprise Accounting & ERP is another powerful enterprise resource planning (ERP) system. This software integrates business information across all departments, including sales, manufacturing, engineering, accounting, and finance, to improve business results. Connected Enterprise Accounting & ERP software is designed for distribution, manufacturing, wholesale, nonprofit, medical supplies, food service, and import/export companies and provides a way to manage all aspect of a high growth business. Connected Enterprise Accounting & ERP also has advanced accounting modules, such as inventory and job costing modules. Order management systems can help streamline order entry, inventory control, and shipping processes. Ability OMS Order Management is an integrated order management system designed to process customer information from a variety of sources, including call center, website, Amazon.com, and point of sale in order to streamline the order management process. Ability OMS Order Management is able to automatically update all sales channels and other third party software whenever an order is placed. Therefore, a brick-and-mortar retail store, a company website, a direct mail catalog, and other sales channels are all interlinked. For this reason, Ability OMS Order Management allows managers and business owners to spend more time running their business and less time managing their inventory processes. This one is not quite accounting software pre se, but as your accounting and inventory tracking becomes more robust, you are going to need to keep all of your information secure. Retailers are beginning to rely more and more on mobile devices for inventory control and management processes. This reliance has proved to be a challenge for IT departments since employees often use their own devices and it's difficult to support the diversity of mobile devices in the marketplace. Absolute Data & Device Security (DDS) for mobile devices allows retailers, manufacturers, and other businesses to remotely manage the iOS, Android, and Windows Phone devices. You can wirelessly (using a data plan or Wi-Fi) configure, query, and even wipe or lock managed devices so that you have more control over the access granted to employees and other third party vendors who are working with your inventory. ADS Advantage Software is an accounting software designed specifically for wholesale distributors and is recommended for small to mid-sized distributors. ADS Advantage is fully integrated to includes functionality for purchasing, inventory, customer service, sales, warehouse management, fulfillment, e-commerce, and full financial accounting. ADS Solutions cites that Amplexus Advantage Distribution Software is used by plumbing, HVAC, automotive, and food and beverage distributors. AdvancePro inventory is designed for small business wholesalers, distributors, online retailers, and import/export businesses. For businesses with advanced inventory needs who are using QuickBooks software, AdvancePro is recommended to help streamline the buying, selling, inventory management, and shipping processes. AdvancePro manages the operations side of the business and syncs all relevant information into QuickBooks for financial record of transactions. AdvancePro allows for many administrative and operational functions like warehouse & inventory control, customer order management, and vendor order management. The program also helps increase efficiency and effectiveness of warehouse and manufacturing environments by automating shipping and receiving tasks.